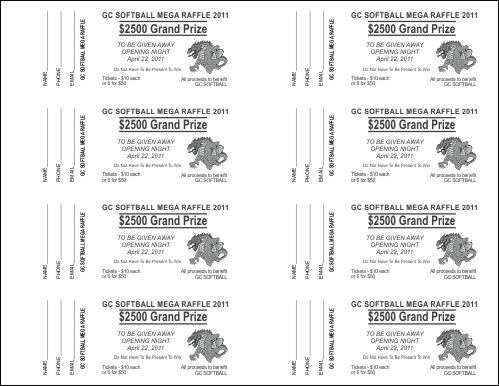 If you want to use this size raffle ticket, be sure to order Small Raffle Ticket Paper which come in packs of 1000 tickets (125 sheets). This will allow you to print only the amount you need, start with a pack of 1000, if you see you are going to sell more than 1000 order an additional pack numbered 1001 – 2000 and so on. Where can I buy raffle ticket paper for these templates? When I worked in our family owned printing business, we were resellers of BlanksUSA products. They are a reputable company and offer paper for these tickets. If you are printing on a laser or inkjet printer, I recommend using the 65 lb. Timberline cover. It is available in several colors. The paper for these templates is listed on the page – size – 2.125″ x 5.5″, 01-1000 Consecutive, 8-up. Click on a row to open options and see available colors. I am not being compensated in any way from the above link, it is simply a courtesy for those who use our free templates.